As sunset approached, this bride and groom needed to leave the church in Auburn, Washington where their ceremony took place and drive over to their wedding reception venue. Since they didn't see each other before the ceremony, we were shooting their portraits afterwards, and were just wrapping up when this multi-trunked tree in the church's back yard caught my eye. 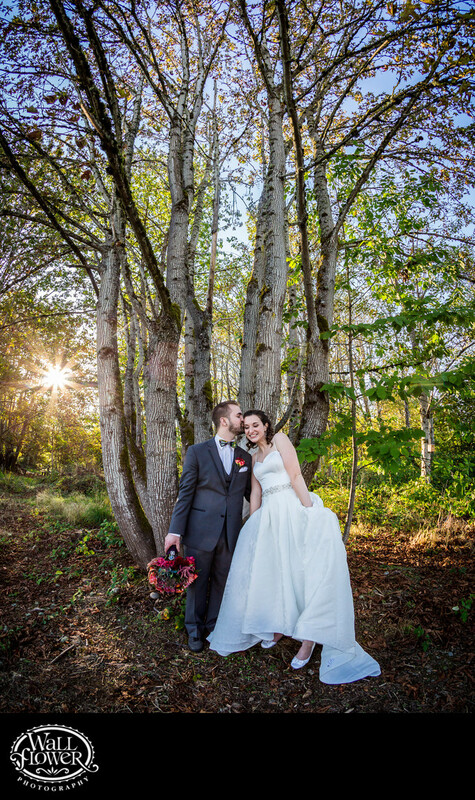 The use of a fisheye lens allowed me to capture an image from the bride's shoes to the treetops, and the cute pose, pretty colors and cool sunburst all come together to make a sweet portrait.